Make sure you have both hard drives connected, then let’s create a New Task. In the upper left corner of the application, click on the New Task icon. Then it’s as easy as 1-2-3. Select your source drive and choose which files you want to clone. I clone All Files. Select your destination drive. This is where your data is copied to. I like to toggle SafetyNet off. Essentially, SafetyNet is a feature where Carbon Copy Cloner keeps deleted files in case you accidentally deleted them and need to recover them later. It does take up a certain amount of space on your drive, which you can set. However, I like to toggle it off. When I mirror my drives, I expect them to be identical copies. With SafetyNet, they aren’t. This is great for my travel drives because whenever I actually connect both drives to the computer, Carbon Copy Cloner automatically starts a backup in the background. I never have to actually click Clone. 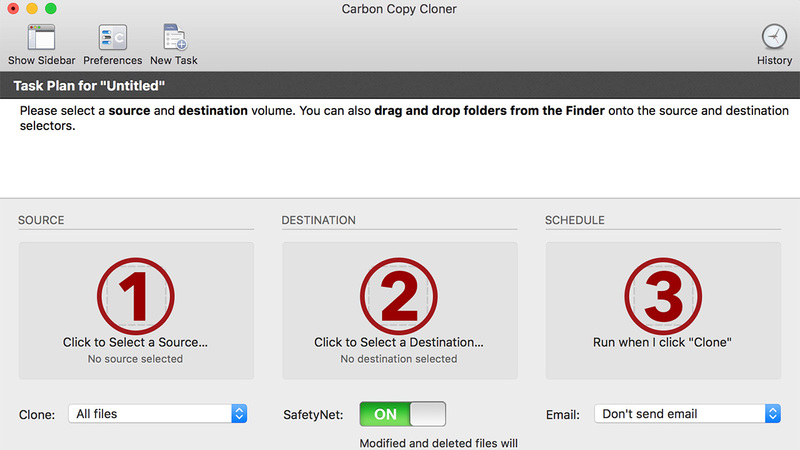 Carbon Copy Cloner is just one of the applications I use to help me backup my data. It’s even helpful if I need to create a backup of my operating system and make it bootable (meaning I can boot up from it in case of an emergency). It’s pretty easy to get set up and I never need to worry about creating backups again.